Private Country Club , All events must be member sponsored , Details are discussed on site. 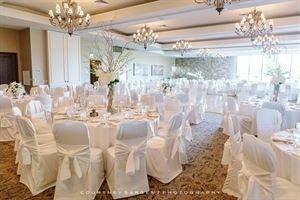 Soft Elegance , 4300 square foot ballroom, one of 6 Ballrooms with 60% window view in Phoenix/Scottsdale. Ballromm capacity is 260ppl outside space for 500 people. Dedicated Catering /Banquet Team with Quality focus for postive memories. All are customized, no two are packaged the same. We customize as to what makes sense for your day and guests.